Fall is my favorite time for hiking. There's something about the cooler temperatures, low-angle light, and crisp air that makes me approach my hiking shoes and backpack with increased vigor. Maybe its knowing that another winter is coming soon, or maybe it's just the season's beauty. Many of my favorite high-country hikes have been calling to me this month. I'm dreaming of the Mt. Mansfield ridge line, the Worcester Range, Camel's Hump and favorite sections of the Long Trail, like the Monroe Skyline from Lincoln Gap to Appalachian Gap. But a cranky 10-month-old who just got four teeth in succession has also got me dreaming of sleep. Getting my tired self out for a hike has been hard. The fresh air and movement is so good for my mental and physical well being, though. For those reasons, I've still been hiking but am selecting locations that are doable for tired parents. 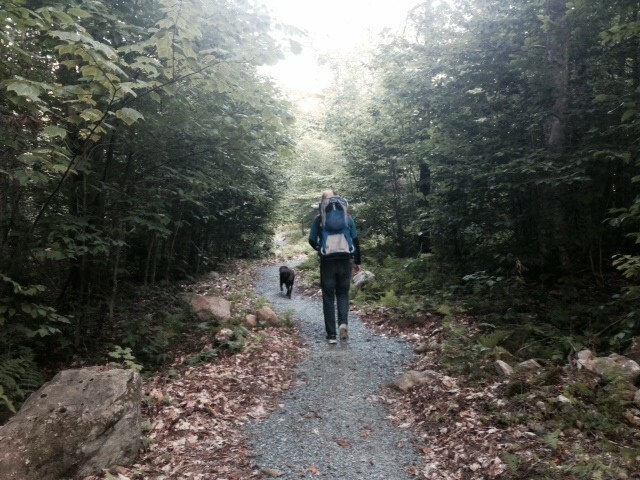 One recent gem was the Telephone Line Trail in Groton State Forest. The trail is near to some other favorite hikes like Owl's Head Mountain and Kettle Pond. But this mellower trail gave me my hiking fix without sapping the little energy I still have. I headed out with my partner, Tristan, our dog, Odin, and our daughter, Elise, in her hiking carrier on a recent evening after work. We parked in the Northern Parking Lot on Route 232 in Marshfield, and walked a connector trail that led from the parking lot to the Telephone Line Trail. Once on the trail, a smooth and even tread wound up and around a small hillside into a beautiful mixed hardwood forest. The path had both natural dirt and crushed gravel terrain. It was the perfect hike for two parents who are so tired they can hardly put one foot in front of the other, never mind navigate rocks, roots and stream crossings. The winding trail eventually meets up with and joins a double track road that leads to Osmore Pond, where weary hikers can splash some cold water on their faces. On this evening, we sat down on small boulders near the end of the trail so I could nurse Elise while our dog explored and Tristan investigated a little further down the trail. When Elise was done nursing and Tristan had returned, we packed up and headed back for the car. In total, it was less than three miles round trip. On our way back to the car, our tummies were growling. We talked about warm fall dinners we could make when we got home, and decided on homemade mac and cheese, roasted carrots from the garden and applesauce. As we walked back through the fading light, listening to birds singing their evening songs, we showed Elise the branches of pine trees, a piece of birch bark and some fallen leaves. Elise held on to Tristan's hair, making motorboat noises and imitating our bear growls. We were still tired when we got home, but also invigorated to have spent time surrounded by nature as a family.